Tammy Beth Rainey writes from small-town North Mississippi where she's lived all her life. A graduate of Blue Mountain College, it was there that she got her start in creative writing placing at least one story in the school's literary journal (which is made up of stories which placed in a writing competition) each year. In her senior year she placed second in the Formal Essay category in the Southern Literary Arts Festival. Her first published work, Painted Ponies, is a collection of three short stories but there are bigger things in the pipeline. Her stories often reflect the people and places of her Southern roots, but always the ideas and dreams that go far beyond those small town settings. 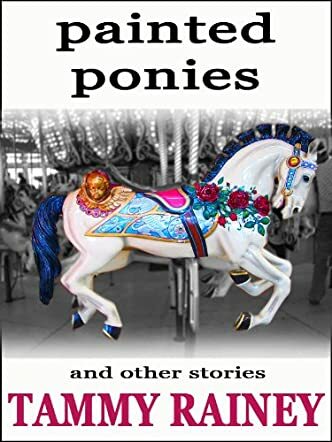 "Painted Ponies" is a collection of three short stories about people in different walks of life that find help, encouragement and hope in ways they never expected. In the story, 'Take After,' Archie loved his son and expected Will to do as he said, but it wasn’t until an unexpected, almost life-threatening accident happened that Archie’s eyes really opened. It was then that Archie realized how important his roll as a father was. “The prisoner of truth is as constrained, nay more so, than the prisoner of misfortune,” this is a portion of the advice from a surprising conversation in 'The Last Best Hour' that gives hope to a prisoner who is facing hopelessness in the awful place where he is awaiting his hopeful freedom. Why would a carousel be so special to someone that they would have to take a ride on every one they saw? In the story 'Painted Ponies,' Jesse found the answer to this question one special day when his mom showed him a video that Jesse didn’t know existed. Then he understood. In her book “Painted Ponies,” Tammy Rainey gives readers three stories that are short, fun, quick and easy to read. If you enjoy reading, but just don’t have the time to read an entire book, this is a nice book you should try. It can be read in one sitting, or you can read each story separately, but whatever you do, you will enjoy these stories and find hope, encouragement and contentment as you read. And if you have young adults around, this would be a great read for them as well.